This week's ISIS-inspired truck attack in lower Manhattan by Uzbek immigrant Sayfullo Saipov has prompted discussions on a number of fronts. There is blowback, the foreign-policy-chickens-come-home-to-roost indicated by an increasing number of radical Islamists emerging from the former Soviet republic of Uzbekistan, a Central Asian nation whose brutal dictatorship is financed and armed by our U.S. taxdollars. There is the ongoing verbal diarrhea of our mentally diseased president, whose tweets that Saipov deserves the "DEATH PENALTY" (caps his) were overshadowed by his even more outlandish suggestion that the suspect be reclassified as an "enemy combatant" (a Bush-era phrase undefined by American law) and sent to the U.S. torture-concentration camp at Guanta'namo. Always the opportunist, Trump also said the "diversity visa" program ought to be abolished because Saipov came to the U.S. under what is more commonly known as the visa lottery. Seems to me that the biggest issue raised by the New York attack is the one we're not talking about: the need to protect bicyclists from cars and trucks on public roadways. Saipov drove his rented Home Depot truck down the West Side Highway onto what becomes West Street, the six-lane road that follows the Hudson River in Manhattan. At Houston Street, just south of Greenwich Village, he made a quick right and a quick left onto the joint pedestrian-bike path that runs alongside the highway. There he mowed down cyclists and pedestrians, killing eight people. Those eight people aren't dead solely due to Saipov. They were also killed by the City of New York and its lousy urban planning. Though in recent years there has been considerable progress in terms of setting aside asphalt for bike paths, walkways and urban parklets, New York and many American other cities, city officials seem largely oblivious to the risks of placing soft human bodies in close proximity to speeding cars, SUVs and trucks. New York, where I live, is one of numerous cities to report success with bike-rental programs. Ours is called Citibike; you rent a bike from a kiosk and return it to a docking station near your destination. In between you make your way down and across city streets, where cars and trucks rule. I almost understand the city's reluctance to dedicate a bike lane to, or to dedicate entire streets, along smaller crosstown thoroughfares. They're too narrow; you'd have to eliminate a lot of street parking, which would create more congestion. But the way New York has handled bike lanes along big boulevards is nothing short of inexplicable. 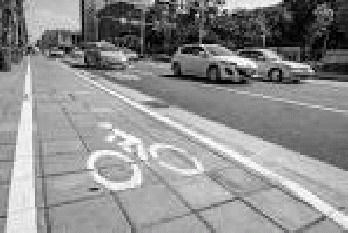 Nothing separates the bike lane from motor vehicle traffic but a line of white paint or, in some cases, short plastic sticks. Forget terrorism-hype aside, terrorism kills so few people that the only rational way for individuals to respond to it is to ignore it and live your life. It's the ordinary accidents that worry me: two cars collide, one or both lose control and enter the bike path. It happens all the time in New York and elsewhere. The West Street path where Saipov murdered his victims benefits from a short jersey barrier along the automobile section. But it's easily accessible to even a large truck driven by a person of ill will, as we saw a few days ago -- not to mention the random drunk who thinks it's a service road. And it contains yet another ridiculous design flaw: putting pedestrians and bicyclists in the same space. Cyclists weave between walkers, terrifying them. Walkers are oblivious to cyclists, creating more accidents. Both deserve two safe, discrete spaces to enjoy the outdoors. What's maddening about this is that this is the kind of tragedy that is predictable and easy to avoid with minimal expense. Bike paths running adjacent to traffic should be separated by solid concrete or metal barriers between intersections. At intersections, a series of metal bars wide enough to allow bikes to pass through but too narrow for cars, and solid enough to stop one traveling fast, should be installed. The same precautions should be taken along densely-populated urban streets in order to protect pedestrians. In May 2017 a man high on PCP drove on a sidewalk in Times Square, killing a woman and leaving more than dozen others injured. But it would have been worse had his vehicle not been blocked by a bollard. Sturdy metal barriers should be installed along busy streets to protect pedestrians from out-of-control cars; at intersections they should go with those poles I mentioned above. You can't protect everyone. You can't anticipate every nefarious plot. But disasters that are predictable, easy to avoid or mitigate, and relatively inexpensive are a no-brainer.